This was one of the most shameful insults in elementary, middle and high school. It was equivalent to saying, “you’re not one of us” or “you’re not cool.” It meant one was doomed to be an outcast, a loner, looked down on by everyone – save the teacher. and challenging the hostile, popularity-obsessed social world. 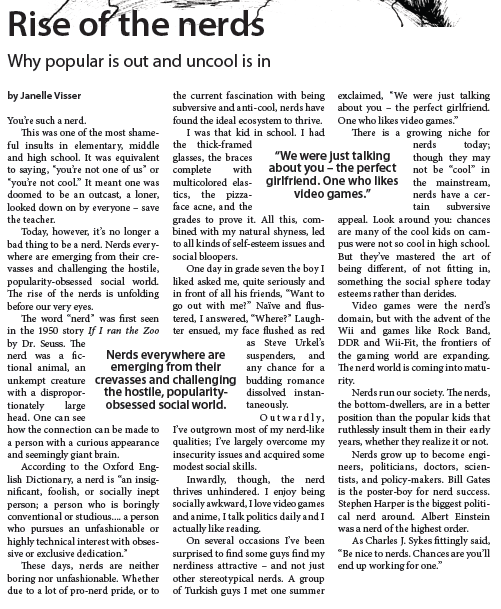 The rise of the nerds is unfolding before our very eyes. 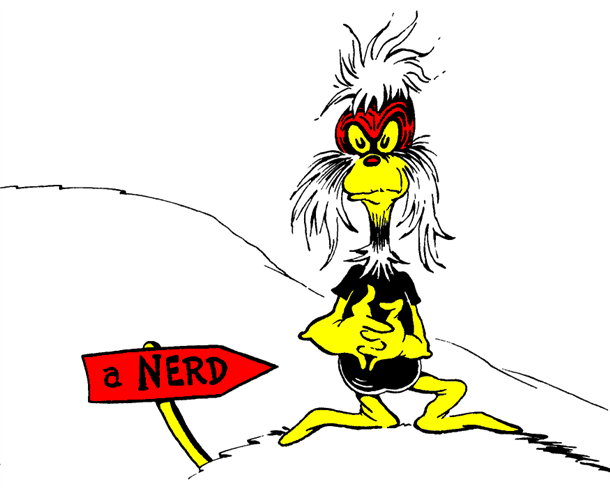 The word “nerd” was first seen in the 1950 story If I ran the Zoo by Dr. Seuss. The nerd was a fictional animal, an unkempt creature with a disproportionately large head. One can see how the connection can be made to a person with a curious appearance and seemingly giant brain. These days, nerds are neither boring nor unfashionable. Whether due to a lot of pro-nerd pride, or to the current fascination with being subversive and anti-cool, nerds have found the ideal ecosystem to thrive. I was that kid in school. I had the thick-framed glasses, the braces complete with multicolored elastics, the pizzaface acne, and the grades to prove it. All this, combined with my natural shyness, led to all kinds of self-esteem issues and social bloopers. One day in grade seven the boy I liked asked me, quite seriously and in front of all his friends, “Want to go out with me?” Naïve and flustered, I answered, “Where?” Laughter ensued, my face flushed as red as Steve Urkel’s suspenders, and any chance for a budding romance dissolved instantaneously. 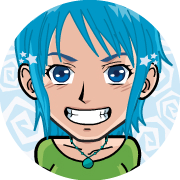 Outwardly, I’ve outgrown most of my nerd-like qualities; I’ve largely overcome my insecurity issues and acquired some modest social skills. Inwardly, though, the nerd thrives unhindered. I enjoy being socially awkward, I love video games and anime, I talk politics daily and I actually like reading. There is a growing niche for nerds today; though they may not be “cool” in the mainstream, nerds have a certain subversive appeal. Look around you: chances are many of the cool kids on campus were not so cool in high school. But they’ve mastered the art of being different, of not fitting in, something the social sphere today esteems rather than derides. Video games were the nerd’s domain, but with the advent of the Wii and games like Rock Band, DDR and Wii-Fit, the frontiers of the gaming world are expanding. The nerd world is coming into maturity. Nerds run our society. The nerds, the bottom-dwellers, are in a better position than the popular kids that ruthlessly insult them in their early years, whether they realize it or not. Nerds grow up to become engineers, politicians, doctors, scientists, and policy-makers. Bill Gates is the poster-boy for nerd success. Stephen Harper is the biggest political nerd around. Albert Einstein was a nerd of the highest order. Originally published in Mars’ Hill Newspaper in February 2009.